Lovely Baxter Beach is 4/10 mile away, great walk! This Cape Cod seaside retreat is a step above! Lovely furnishings, vaulted ceilings, modern amenities, and a fenced in yard all combine to make this an ideal vacation home. Whether relaxing inside, or outside on the deck, the surroundings are sure to please. A short stroll will bring you to Baxter Beach where you can take in the ocean views of Lewis Bay and swim in the calm waters. The island ferries are very close by, making a trip to Nantucket or Martha's Vineyard a breeze. When relaxing in the yard you can hear the ferry horns distinct sound in the distance. This home is light filled with an open floor plan. The living room /kitchen has a vaulted ceiling with 2 ceiling fans, a 55 inch flatscreen TV and DVD player. High-speed wireless internet is also provided. Board games and toys are on hand for family fun. 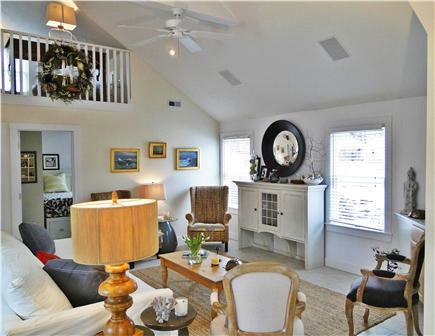 Furnishings and decor provide a cozy coastal feel. The kitchen is fully stocked and has a gas range. A Kuerig coffee maker and auto-drip coffee maker are on hand for preparing a morning cup of coffee to enjoy on the sun-lit deck. An extra large capacity Samsung washer/dryer is located on the first floor. 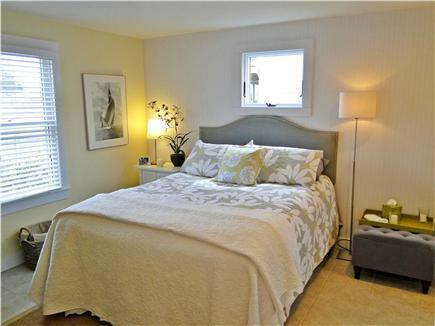 Each bedroom has been furnished with quality mattresses and linens. There is central Air Conditioning throughout the home. The queen bedroom offers a 37 inch flatscreen TV. A full bathroom with tub/shower is adjacent to the bedrooms. 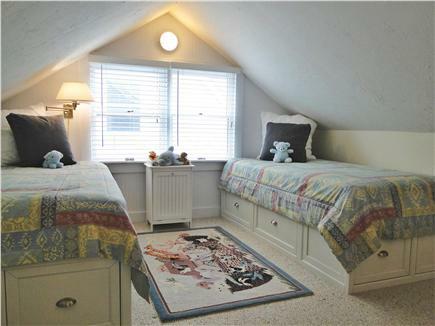 The upstairs loft includes two twin beds and a desk. All linens are provided for your stay. In the completely fenced in back yard, you will find a shed with yard games and storage for bikes. Sit outside on the deck and enjoy outdoor cooking on the gas grill, or refresh in the private hot water outdoor shower. 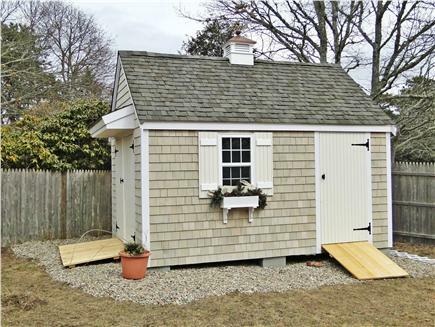 Beach chairs, beach blankets, umbrellas and a large beach cooler are to be found in the backyard shed, also. A fire-pit is waiting for roasting marshmallows. There is a large picnic table with an umbrella and a beach wagon to load for your stroll to the neighborhood beach as well as a wagon for toddlers. 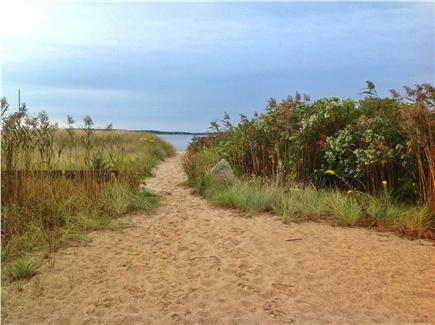 Beautiful Baxter Beach is located 4/10 of a mile away and an easy walk from the home. The bay waters are calm and perfect for swimming, kayaking and paddle boarding. More populated beaches are only 1 to 2 miles away, Seagull Beach being one of them. The neighborhood is great for finding nearby fun! There is an old time mini-golf course which serves ice cream at the end of the street. There are many restaurants, shopping and fun family entertainment opportunities very close by. Main Street in Hyannis is filled with shops and restaurants and a short drive away. This is a great location for families. Hyannis Harbor is nearby and a perfect place to visit. Dogs are warmly welcomed at Baxter Beach House. Please speak to me about including your family pet during your Cape getaway. 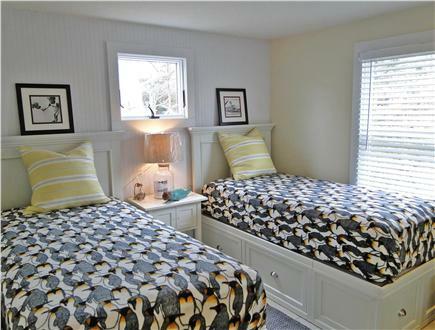 Great vacation memories await you at Baxter Beach House ! Additional pricing info: Linens included in weekly pricing. $125.00 cleaning / turnover fee, State and local taxes of 14.45% will apply. We stayed at this property in late October and loved it. The second we walked in we were amazed at how it matched the pictures perfectly. Judi was such a wonderful hostess. She left a brand new drip coffee maker on our door step an hour or so after we arrived. The house was clean and decorated wonderfully. The house is so well stocked that when Judi says don't bring anything extra, you really don't need to bring anything extra. This was our first time on the Cape as a family, and we could not have been happier with our rental. Judi was a pleasure to deal with, was there to help us at every step, and even left stuffed animals for our kids upon arrival! The cottage was immaculate and fully stocked with linens, towels, etc. We were able to pack light which was awesome. The fenced in backyard and shed full of beach gear and toys was a great convenience, and resulted in some fun backyard olympics with our kids! She even had s'mores ingredients in the fridge for us to use with her firepit. The cottage was walking distance to a great, quiet beach, as well as mini golf, ice cream shops, etc. 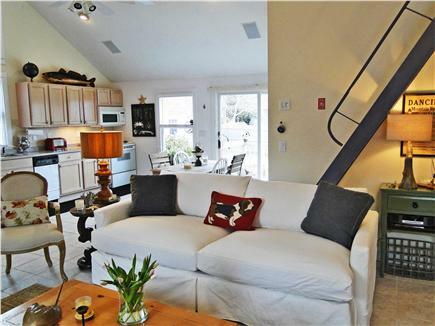 A short drive to Hyannis center and shopping, great restaurants, etc. This was truly a dream cottage and week for our family. This is an owner that goes out of her way to provide a memorable experience for her renters, and is always available for questions or a helping hand. If there was a rating higher than 5 stars, we would absolutely rate it so. We stayed at the Baxter Beach House for a week with our two children at the end of July. Judi was wonderful to deal with before the trip so I suspected we were going to have a great stay! We were delighted as we entered the home. It was tastefully decorated, just as in the photos and my kids were amazed at the outdoor shower! Judi told me to pack light and she was right! She had us stocked up on EVERYTHING we needed for our stay! From paper goods to sunscreen. She called and texted to see if there was anything we needed throughout our stay. She was such a wonderful host! What a fantastic home. Judi told us don't bring anything and she was right. She has lawn chairs, umbrellas, beach games and floats, outside fire pit with wood and starter sticks, picnic table and a back yard to die for. Private and great for our dog LuLu to let out and roam the back yard and not worry about her running away. The washer and dryer were amazing and the stock of towels for the beach and showering was fantastic. The central air was a dream in the hot July days. The outside shower, walk to beach, big screen TV with Xfinity and every channel you could ask for. The neighborhood and closeness to things to do was perfect. I recently stayed at Baxter Beach House for the 2nd year in a row. This beach house makes for the perfect vacation! 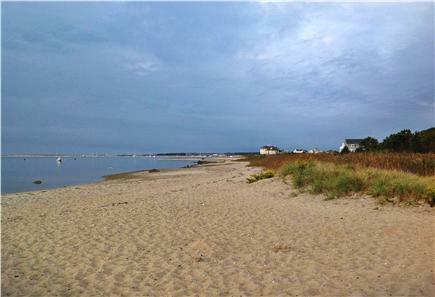 The location is amazing, being so close to Hyannis center and right down the road from a cute little beach. We had our black lab with us and she absolutely loved the beach! She couldn't wait to just run right in that water and start swimming! The neighborhood was also wonderful to take her for walks in. The back yard is completely fenced in and has an enclosed outdoor shower, so if you are traveling with a dog, it is very easy to give them a bath after playing at the beach. The inside of the house is just beautiful. It is so open and airy, with lots of natural light. Luv the house. The decor is perfect for this house. It is near the beach and plenty of restaurants and shops near by. Very short ride to Hyannis and Chatham centers. Judi was amazing. She called just to make sure nothing was needed. Judy accommodated us on very short notice at an unusual time of year. Her place is well-appointed, wonderfully decorated, well-stocked, and clean. The location is excellent, close to beaches and town. Highly recommended. My family of four stayed here with our new dog, and it was such a fantastic experience. Judi, the homeowner, is absolutely terrific in every way - she makes certain to appoint the home so beautifully and with everything you could possibly need. She made herself available for any questions, dropped off goodies for our girls and our dog, and we took her up on her offer to watch our dog while we went to Provincetown to whale watch - and she even took him for the day rather than leave him crated in the house. This is just an example of how she goes over and beyond to make your stay wonderful. 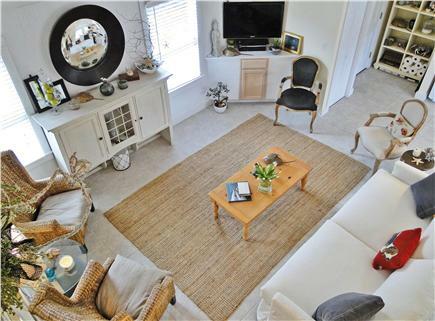 The house is immaculate, bright, and very comfortable to relax in. We were there for two very hot weeks in August, and the central air was delightful to come into from outside activities. 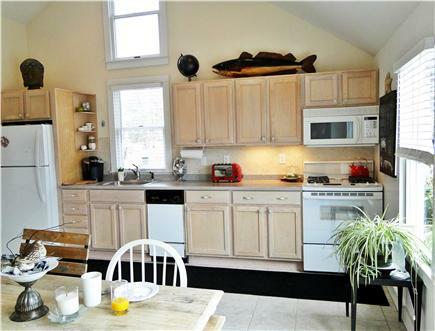 Judi has the kitchen well-stocked, great beach gear, lots of towels and cozy linens - you really don't need to bring anything! 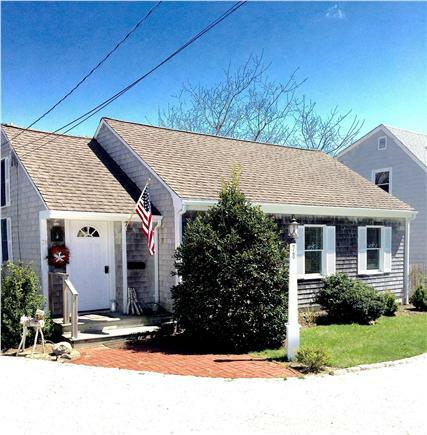 The home is greatly situated on the Cape - it was our first trip, and we enjoyed the ease of getting to the island ferries, strolling and dining in nearby Hyannis, and being able to head up easily to the National Seashore beaches and biking on the rail trail. Having Baxter Beach right down the road is amazing - a very low key, small beautiful beach that we can walk to with the dog and cool off together with him. I really cannot write enough good things about this vacation home- it was really hard to leave when our two weeks were over!